Fri., April 12, 2019, 6:50 p.m.
One of the oft-forgotten elements to what’s been a run of excellence for the Sounders going on three-plus years is how they’ve managed it without a one-season reboot. The same can’t be said for their Saturday afternoon opponent, Toronto FC, a franchise that began its own stretch of excellence around the same time back in 2016. A glaring difference between the sides was Toronto crashing and burning to the league’s third-worst record last season less than a year removed from arguably the best Major League Soccer campaign ever. 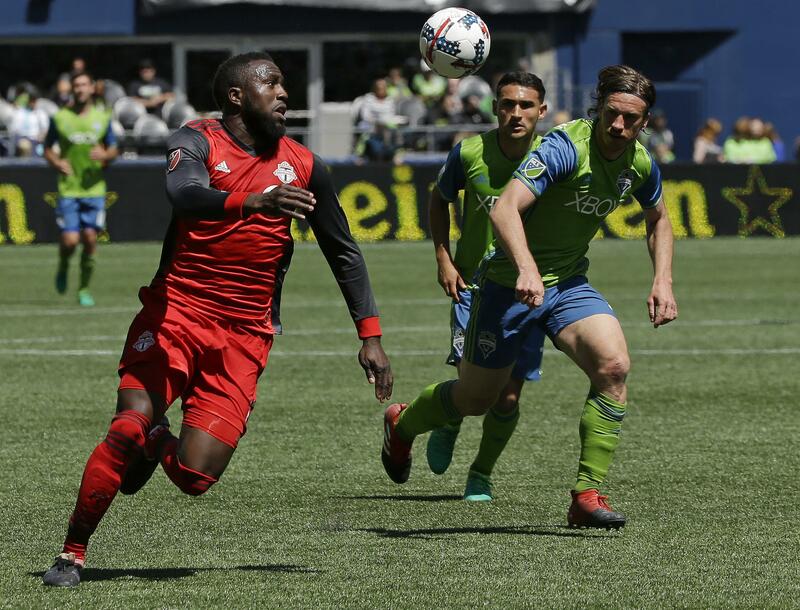 This season, the “Reds” have picked up right where they left off in dismantling the Sounders in the 2017 MLS Cup final, signaling to many that their dismal 2018 finish might have been an aberration. Certainly, the Sounders are taking the clash Saturday at CenturyLink Field with utmost seriousness given all things between these teams and the current standings. Not only a big game because the Sounders are 4-0-1 with a plus-eight goal differential and taking on an MLS Cup rival that’s started 3-0-1 with a plus-seven goal differential. But also because following this clash, the Sounders face 5-0-1 Los Angeles FC twice before the end of the month. With the Sounders and LAFC looking to possibly go to the wire for Western Conference supremacy, the next few weeks could play a determining role. The Sounders remain somewhat miffed at having been made to fly to Denver ahead of being told their game Wednesday against Colorado was being rescheduled because of a pending blizzard. Their flight home didn’t return until about 4 a.m. on Thursday after numerous delays. But any player tempted to use travel as an excuse for a lack of focus Saturday need look no further than coach Brian Schmetzer. Only a few hours after the team plane landed, Schmetzer learned his father, Walter, 85, a long-standing youth coach and well-known Lake City sporting goods store owner, had died after a brief battle with cancer. And yet, Schmetzer was back out at practice Friday morning saying he appreciated the outpouring of public support and that he planned to work the game Saturday. Schmetzer’s teams emulated his get-it-done approach and work ethic during shortened offseasons coming off MLS Cup final appearances against Toronto in 2016 and 2017. Their playoff push last year, securing a first-round bye after the worst start in franchise history, is the biggest separator from a Toronto club that couldn’t answer the MLS bell after nearly winning the CONCACAF Champions League final over Chivas. As witnessed by defending MLS champion Atlanta United FC, demolished in Champions League play this spring and just 0-2-2 this regular season, the “hangover effect” of teams winning it all is very real. Whether it’s the six-week offseason, Champions League obligations or opponents going extra hard at the reigning champ, precious few MLS teams have contended as consistently as Schmetzer’s group. “I know the experience of playing non-stop for two years, so I think it took its toll on it,” Schmetzer said when asked about Toronto’s stunning dropoff last year and current resurgence. “I don’t have all the ins and outs of their locker room. I’m certainly very proud of our team for not falling into that trap, for continuing to make the playoffs. Portland and Columbus in (the) 2015 (final) did not make the playoffs in 2016. Toronto fans and some players have chirped about how they should have won the 2016 final, in which the injury-hampered Sounders bunkered into a defensive shell, got a miraculous overtime save from Stefan Frei and captured the title on penalty kicks. The Toronto players seemed determined to prove themselves the rightful champions in 2017, blowing away the field in going 20-5-9 for a then-record 69 points before pasting the Sounders 2-0 in a finals rematch. Still, while the Sounders have yet to enjoy as complete a season as the Reds in 2017, they’ve lost only twice in their past 24 regular-season matches going back to last June – a 19-2-3 mark that translates to an 80-point season if continued over 10 more games. A big difference-maker for Toronto this season has been a healthy forward Jozy Altidore, injured for much of last year after the Champions League effort. Spanish midfielder Alejandro Pozuelo has two goals and two assists already in two matches since coming over for four years, $18.2 million to replace departed designated player Sebastian Giovinco. Between the two of them, the Sounders will have their hands full in a rivalry that might not have geography going for it but does come with some of the highest stakes around. A history that sees them 1-1 in head-to-head MLS Cup play and steaming toward a possible finals rubber-match in November if the season keeps playing out like it has. Published: April 12, 2019, 6:50 p.m.